Rooms, services Hotel-Siesta Üdülőszálló Hajdúszoboszló is offering 5 tasfefully furnished, nice rooms for those looking for a place to stay at in Hajdúszoboszló. The hotel ensures a pleasant stay for you and your family by offering chield-friendly services. Your small pet is also very welcome during your stay at the hotel. An additional fee applies to taking your pet here. In case you ever feel like eating in, you may taste delicious local dishes in the restaurant of the hotel. If neccessary, you may park your car at the parking place of the hotel for free. Even during the hottest summer days the temperature is pleasant, thanks to air-conditioners being in operation in some of the rooms (you can make sure on the information sheet of each room if it features air-conditioning). Wireless Internet connection (WiFi) is available at the hotel, ensuring that you can stay up-to-date during your holiday. You can find the exact list of services provided by Hotel-Siesta Üdülőszálló Hajdúszoboszló (including those for extra fees) and the exact equipment of the rooms on the information sheet below and on the information sheet of the respective rooms. Location The hotel is located Tastes of Hajdúság Festival 1.3 km, Hungarospa Hajdúszoboszló 800 meters, Gokart 500 meters, Bocskai István Museum 2.4 km, Toros Days Hajdúszoboszló 1.3 km. Payment The following methods are available to pay the reservation: cash, bank transfer, debit/credit card, széchenyi recreation card. Hotel-Siesta Üdülőszálló Hajdúszoboszló is asking for 20% advance payment. Arrival, opening hours The earliest arrival time is 14:00, the latest time to leave the rooms is 10:00. Hungarian, English, German, Russian and Polish languages are spoken by the personnel. 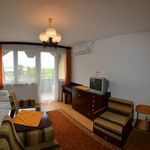 The rating of Hotel-Siesta Üdülőszálló Hajdúszoboszló is 8.7 from the maximum 10, 26 based on actual and valid guest ratings and reviews. "Hotel should be refresh. Dark corridor and and old furnitures in room." "Sokadszor szállunk meg itt, véleményünk nem változott, megfelelő." "A szoba tisztasága, barátságos személyzet, kellemes környezet."